For this week's Giveaway I'm offering a bundle of my very first Limited Edition collection for Art Gallery Fabrics, Wild & Free! Today's offer will include a fat quarter of each of the EIGHT prints that make up this collection! That’s 3 possible entries! Enter now through Monday evening, September 28th. A random # generator will pick the winner and I will announce their name at the bottom of this post! It would be so fun to make a quilt. The quilt on my bed is looking a bit worn. Fingers Crossed! I will be first today I have a Fat Quarter bundle of this its Gorgeous I take it out every day and pet it Lol...Happy Friday everyone. I already got the M bundle form the IT that includes some of these for a quilt for a cousin, but having more of this whole bundle would just make the quilt that much better. I'd love to make a quilt with these! And it would be all mine!!! I would love to make a quilt for my son with this! tks! I follow you with bloglovn!! have a great weekend! If love to make some stylish Bandana Bibs! Such pretty fabric, I am thinking pillows would be lovely with these fabrics. I have loved your fabric from day 1 !!!! I would add a few splashes of plain colors to set off your patterns and make a herringbone quilt as you go quilt. I really love these prints and fall colors, I would make a tote bag and zipper pouches, mixing all the prints together!! I follow you on instagram and on facebook!! I need a NEW tote bag, my dog keeps eating mine. Shared your facebook post on facebook as well!! thank you Maureen!! What cute fabric! They would make the cutest pouches. Thanks! I follow you on instagram and facebook . I would use it for a throw quilt. Probably a zigzag quilt. Those fabrics are so beautiful. Patchwork top for my daughter. Oh, that would be a beautiful quilty something for ME - I've made nearly everyone else a quilt. I follow you on FB and Bloglovin'. Ok let's try this again. Lol. ❤️❤️❤️❤️ all of your fabric collections!! I'd make a throw for my couch. I would use this in a pillow! I love yours that you have shown here. I would love to make beautiful wallhanging for my formal living room area the colors are perfect! I've been wanting to make a bag lately...maybe the Birdie Sling (Amy Butler pattern). I have shared this great giveaway on facebook . Love this collection. I would make a large throw with it. I think I would love to make some Fall patchwork throw pillows for our guest bedroom! The colors are so yummy! This screams out with the memories of German Picnics at Rice Lake when I was a child. Good music , food , and most importantly friends. I bet you know already what I would sew with this? Anything for picnics and apron dress with a German bust. I follow on Fb under Kelly Jean Curto. Please find me if I win!!!!!! I am a loyal follower of yours on FB also! Another beautiful collection. Follow you on FB and look forward to your blog. 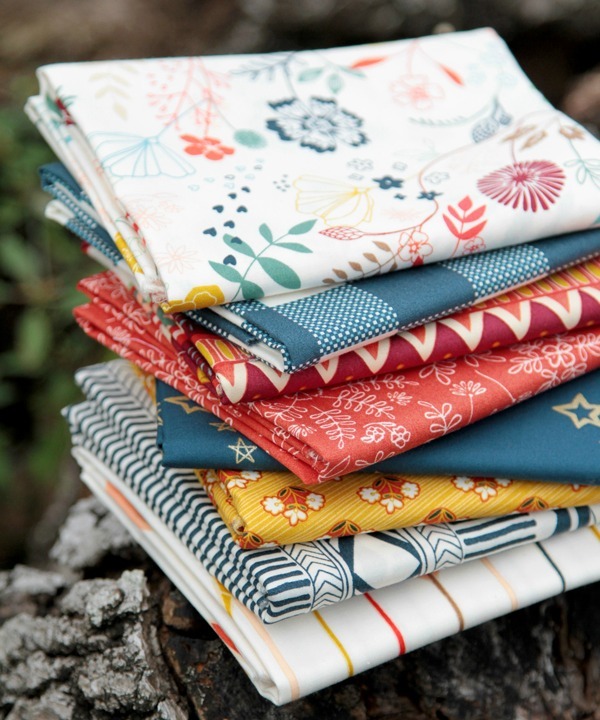 I would make a quilt with this beautiful fat quarter bundle! A quilt, table runner, a bag, fun, fun! Looks like a table runner or two and some pillows. Thanks. A couple of totes so I would have them with me all the time. I am following you on Facebook - thanks. a blanket for my newborn baby! I have been wanting to do a large bear paw block quilt. I think this would be fun to do in wild and free. What beautiful colors, especially for fall! I am in the mood for some fall cushions, so I think if I won I would make some.. after making myself a beautiful bag/purse. Thanks for this awesome giveaway, Maureen! Oh I love this line. I would probably make a baby quilt with this. And some great napkins for our table. I enjoy following you on Facebook, Maureen. I will make a quilt for min Grandon! I'm sharing this chance to win some beautiful fabric on Facebook. I'd make a new bag - purse size - love the patterns on this collection. I love this collections and I would make a lap quilt for my MIL with it! The colors and patterns are exactly her style! I need to make a thing size quilt with this bundle. I see some bag making and some kitchen curtains and a lap quilt! Thank So! I follow you on facebook and insta! I'd make cute fat quarter skirts for my granddaughters. I see a medium size half square triangle quilt with these beautiful fabrics!! I pinned the giveaway and your beautiful bundle. I would make a quilted pillow top. I love this fabric collection! You did a fabulous job creating it. :) I would make a lap quilt with it- do some selfish sewing for once! I love your fabric collection, and I would definitely be making a quilt for me. Really liking the navy colors, would make a quilt for fall. I need more of this for a quilt! Sooooo pretty! I would love to make a quilt as it is all the same colors as my family room! Oh this would be incredible! I hope I win! I follow on IG too!!!!!!!!!!! I follow you on the blog, instagram and fb. And it has been shared! 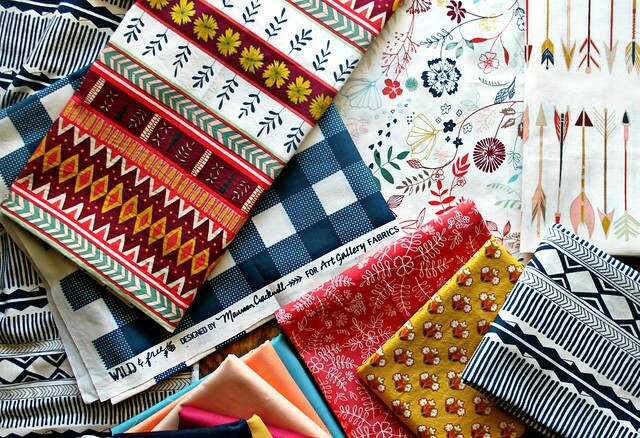 I would love to make a fun modern quilt with these fabrics. I would make a table runner! So gorgeous! I follow you on Facebook Maureen. :) Love your Friday giveaways! Thanks for the chance! And I shared on Facebbook - bit reluctantly because I'm not good at sharing! Here is my Tweet! :) Thank you! One of my favorite collections! I only have a few scraps left so having some more for a quilt for myself would be wonderful. Thanks! Looking at your pics of your fabric, I noticed that they look great together, but the prints by themselves look like they are from different styles of collections. So, I would probably put them in my stash - break up the group - and sneak Wild & Free into all of my future projects! The floral print in a girl's quilt, the gingham in a boy's quilt, the arrows in a bag, the stripes as a border in a mini-quilt. There are just so many possibilities! Love this collection. Would use it to make a long overdue quilt for my parents. Gorgeous! I would make makeup bags for Christmas presents! I would add this bundle to the fat quarters that I am collecting for a "plus"quilt. It's going to be a selfish sewing project for me! Thank you for offering it as your Friday give away. Who wouldn't love to win this beautiful collection?! I follow you on Instagram and on your blog. I'd make a gorgeous pouch collection all for myself. I'd love to stitch a bag! I think it would have to be a baby quilt, gorgeous collection for so many things though. And I follow you on FB and blogger. I am a faithful follower of yours via bloglovin! 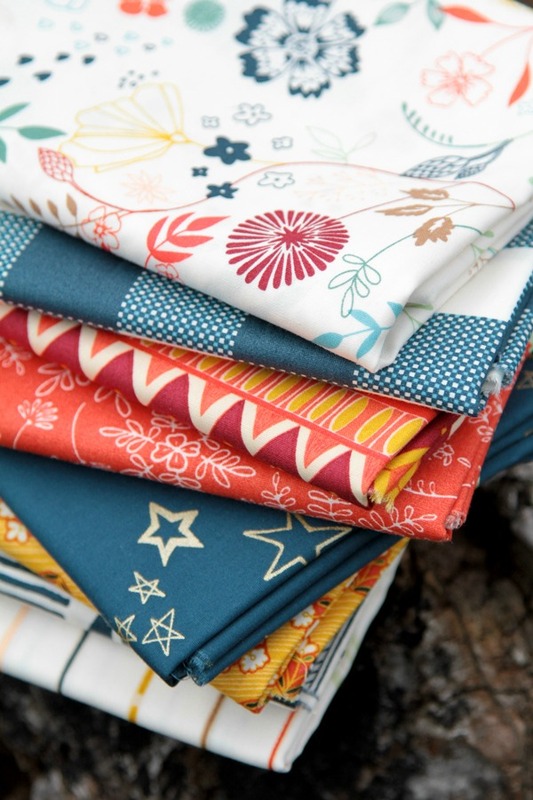 A wonky star quilt would be lovely in these fabrics! LOVE YOUR NEW COLLECTION>THANKS FOR THE GIVEAWAY! These would make a lovely wall hanging or lap quilt. Gorgeous fabric. I think I'd make kitchen accessories, Placemats, pot holders and appliance covers. Love the fabrics! I would add these to my stash I've fpulled to make the farmer's wife quilt! love your collection; a lap quilt for me! I follow your blog using Bloglovin'. Such inspiration in your quilts. The colors in the fabric bundle remind me of summer and I have a pattern for a "picnic" quilt that would make good use of these fabrics. Thanks for a chance in the giveaway. My husband says he would love to have lots of fun outfits for our little girl. So these fab fabrics would go towards those. I'd love to make a table runner for my new coffee table, and maybe a cushion or two with the leftovers! I would make a throw quilt for a friend. Thanks for the chance. I love your designs. What a great chance to win. I receive your email posts and admire your bold approach to quilt design. Great fabric. I would make a duffle/getaway bag. Oh, I love these prints. IF I can part with them, I'd probably make some doll quilts for my granddaughter, who thinks that each of her dolls needs a quilt for its nap! She would enjoy these bright, pretty prints as much as I would.